How engaged are you? You’re engaged if you work with passion and feel a deep connection to your organization. You’re innovative and strive to move your organization forward. You’re not engaged if you are essentially “missing in action” at work. You’re just going through the motions, putting time – not energy or passion – into your work. And you’re actively disengaged if you aren’t just unhappy at work, but you’re acting out your unhappiness by undermining your engaged co-workers’ accomplishments. This article explores the concept of Employee Engagement as a competitive advantage to an organization and examines international and Caribbean research on Employee Engagement and its implications for the global competitiveness of Caribbean business. Today’s competitive environment calls for new and innovative ways to manage human capital, increase productivity and generally create value through people. The 21st Century is the century of human capital. It is people who will make the difference in the knowledge economy – even in an economy downturn. Therefore, the focus for organizations must be on what is required to optimize the value of their people. Over the last decade or so, the concept of Employee Engagement has emerged as a critical driver of business success, as it promotes retention of talent, fosters employee and customer loyalty and improves organizational performance and stakeholder value. Being a relatively new concept, Employee Engagement has as many definitions as there are person writing about it. It has been variously defined as the extent to which employees feel a sense of commitment to their organization, to its values, goals and objectives, and consciously and conscientiously work toward achieving those goals and objectives; or the extent to which employees find value in their work, want to work and want to contribute to their organization’s success; or the extent to which employees choose to invest their physical, mental and emotional energy in their work and their organization. One of the more precise definitions of Employee Engagement is that given by the international consulting firm, Hewitt Associates, who describe it in terms of three primary behaviours: Say, Stay and Strive. “Say” is demonstrated when the employee consistently speaks positively about the organization to co-workers, potential employees and customers. “Stay” is shown by the employee’s intense desire to remain a member of the organization, despite opportunities to work elsewhere. And “Strive” is the extent to which the employee exerts extra effort and exhibits behaviours that contribute to business success. It is this last behaviour in particular, which has the potential to turn Employee Engagement into a competitive advantage. 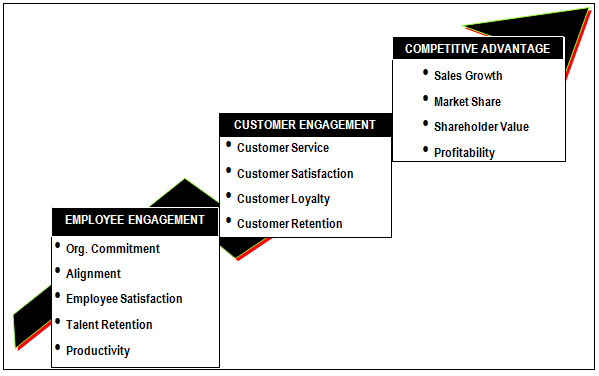 Figure 1 below makes the link between Employee Engagement and competitive advantage. It shows that Employee Engagement leads to customer engagement, which, in turn, leads to business success or competitive advantage. The figure suggests that Employee Engagement results in employees’ commitment and loyalty to the organization, alignment with the organization’s goals and objectives, employee satisfaction, retention of talent and productivity, among other things. This leads to better customer service and hence, greater customer satisfaction, loyalty and retention. And this leads to increased market share, greater profitability, sales growth and increased shareholder value. perform 20% better than disengaged employees and are 87% less likely to leave their organization. work harder, are more loyal and are more likely to “go the extra mile” than disengagement employees. are 5 times less likely to have a safety incident and 7 times less likely to have a lost-time accident than disengaged employees. In one US study, the average cost of a safety accident for engaged employees was US$63.00, while the average cost for disengaged employees was US$392.00. This company was able to save over a million US dollars by increasing employee engagement. In another study, the quality of service and customer loyalty increased as employee engagement increased. This finding has implications for organizations in the service industry in particular, e.g. banks, insurance companies, hotels, restaurants, and, of course, the Public Service. Finally, in a global survey of employee engagement of 50,000 employees in 27 countries, high engagement organizations were found to have almost 10 times as many committed, high-effort workers as low engagement organizations. My company inspires me to do my best at work everyday. I am proud to tell people where I work. I am not thinking of leaving this company any time soon. Most of the time, I feel motivated to “go the extra mile” for my company. I would recommend my company to relatives and friends as a great place to work. Even if I were offered another job with similar pay and benefits, I would still remain with this company. Overall, I am generally satisfied working with this company. The average level of agreement with these statements was 61%. When compared with other parts of the world, this is a relatively good engagement score. However, when the statements are taken separately, only 54% of the employees are willing to remain with their company if offered another job with similar compensation; only 55% are inspired by their company to do their best at work everyday and only 66% are generally satisfied working with their company. On the more positive side, as many as 77% are proud to tell people where they work. Although Employee Engagement in this survey may appear high, there is still much work to be done in our organizations to improve the level of engagement to where is could become a competitive advantage. Know Them. Be as familiar with employees as you are with customers. Use that knowledge to shape workplace programmes that win their hearts and minds. Grow Them. Challenge and develop the workforce. People want to learn and excel in their jobs, and they commit to companies that help them. Inspire Them. Establish an emotional connection. When people’s work has meaning, they are more inclined to do whatever it takes to ensure success. Involve Them. Communicate clearly with employees, gather their input, and let them act. Knowledgeable, valued workers add more value. Reward Them. Deliver a “deal” that is fair and meaningful. When people believe they are treated right and appreciated, they give more of their time and creative energy. Unfortunately, these are the very areas that we have found to be the weakest in many of our regional organizations. HR policies and practices that support, rather than hinder employee engagement, for example, an objective performance management system. Building trust through continuous open dialogue between management and employees. Holding managers accountable for improving their employees’ engagement levels, because what gets rewarded gets done. Providing opportunities for employees to grow and develop. Rewarding and recognizing employees for their contribution. Thankfully, more and more regional organizations are recognizing the value of Employee Engagement and its importance for their competitive advantage. Why Would Anyone Want To Work For You? © 2015 Quality Consultants Limited All Rights Reserved.